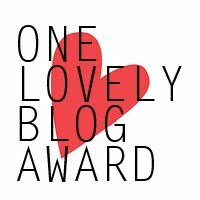 I have been nominated by Patricia from Art Does Matter for the One Lovely Blog Award!! In order to accept the award and pass it on I have to complete a couple of tasks. First… thankyou to Patricia for nominating me. Patricia’s blog is diverse and is well worth a visit, with posts about painting, ceramics sculpture, photography, her own artwork, other’s artwork, and lots more. Secondly I have to share seven secrets about myself… this is the tricky bit! 1. I have had a very nomadic life – not by choice – and have moved thirteen times. Were I live now is the longest I’ve lived anywhere, and I never want to move again. 2. Despite this nomadic lifestyle – or maybe because of it – I can quite easily become a hermit, and bury myself at home writing, drawing, reading, etc. 4. My dogs name is Eddy and no matter how much we try to control his diet, he just keeps getting fatter! 5. When I was young I used to collect stamps… and I still like looking at them. (sheesh, that was a hard one). Recently I made an artwork about colonialism and used some stamps on the artwork. An image of this artwork can be seen here. 6. Some people would call me a radical socialist feminist – but I just believe in equality. Unfortunately there is not much of that around.